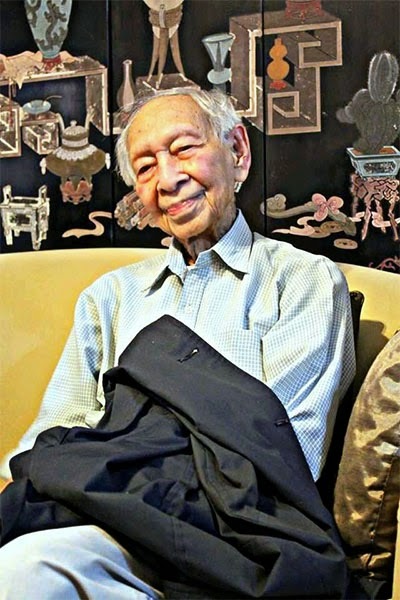 Engineer Fernando "Panding" Perez Javier is said to be the Philippines' oldest living veteran. He is 106. Engr. Javier was enlisted in the "A" Company, 4th Engineering Battalion, Philippine Army based inPuerto Princesa, Palawan even before the outbreak of World War 2. He served his unit as the Commanding Officer. He also served as Construction Officer of the United States Armed Forces in the Far East (USAFFE) during World War 2. He was among those who were forced to surrender on 09 April 1942 -historically described as the "day that will live in infamy." Along with the thousands of his American and Filipino comrades, he was forced to trek the infamous Death March from Mariveles, Bataan - a tortuous march to their impending suffering and death. With God's protection, hesurvived his ordeal as a Prisoner-of-War (POW) at the former Camp O'Donnell, aUS Army base in Capas, Tarlac that was turned into one of the largest concentration camps of the Japanese that eventually became an interment ground for the American and Filipino soldiers. After the war, he continued serving his motherland in his capacity as a public engineer until his retirement. His spouse, Lourdes, died on 30 December 1968. He had three children - Fernando Jr., a chemist; and Andrew, aformer newscaster, who are both based in the USA; and Lorna who is taking careof him. He has seven (7) sons.